Coo-Var Glocote Protective Coat is a clear glaze which can be used to protect the exterior performance and prolong the colour retention of Coo-Var Glocote Fluorescent Paint. It can also be used to increase the durability of Coo-Var Glocote Fluorescent Paint on floors, where frequent cleaning is required when exposed to chemicals. Coo-Var Glocote Foundation is a high density white base coat that should be used under Coo-Var Glocote Fluorescent Paint to increase the visibility. 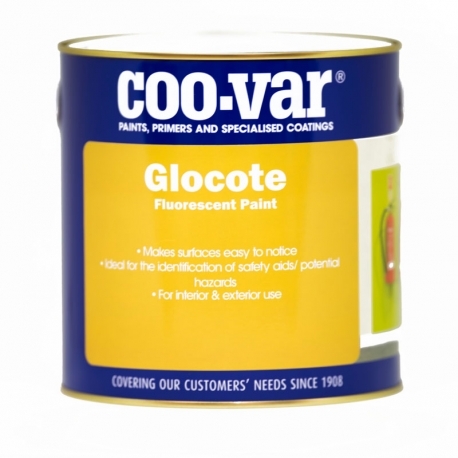 The white base coat provided by Coo-Var Glocote Foundation is essential for Coo-Var Glocote Fluorescent Paint to function properly. Coo-Var Glocote Protective Coat is available to enhance the durability when used externally, on floors to mark escape routes, or surfaces exposed to physical and chemical wear. Provides a high visibility surface and is recommended in pedestrian foot traffic areas, or in factories or other workplaces that require a safer, more visible surface.&nbsp;Whether you are applying to wood, concrete or metal, Reflective Hazard Tape provides a safer solution to potentially dangerous foot traffic areas. 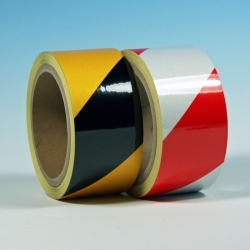 An economical, light weight and weather resistant Barrier Tape for cordoning off restricted areas such as building a perimeter for containment and providing added visual warnings to restricted areas where dangerous work may be taking place or where emergency services may be operating.